CRIME SCENE: THE FEDS takes you right to the heart of the Bureau, from Quantico	to the Hoover Building and beyond. Here you will learn all you need to know about the	FBI's history, organization, duties, procedures -- and enemies. You've been given the best training. You have access to resources, intelligence and equipment that other law enforcement agencies can only dream of. It is time to put those advantages to work. You and your team are your nation's	last line of defense. 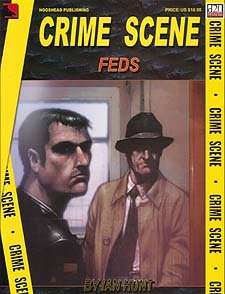 CRIME SCENE: THE FEDS - YOUR ULTIMATE RESOURCE FOR PROTECTING THE USA Requires the use of the Dungeons & Dragons� Player's Handbook, Third Edition.